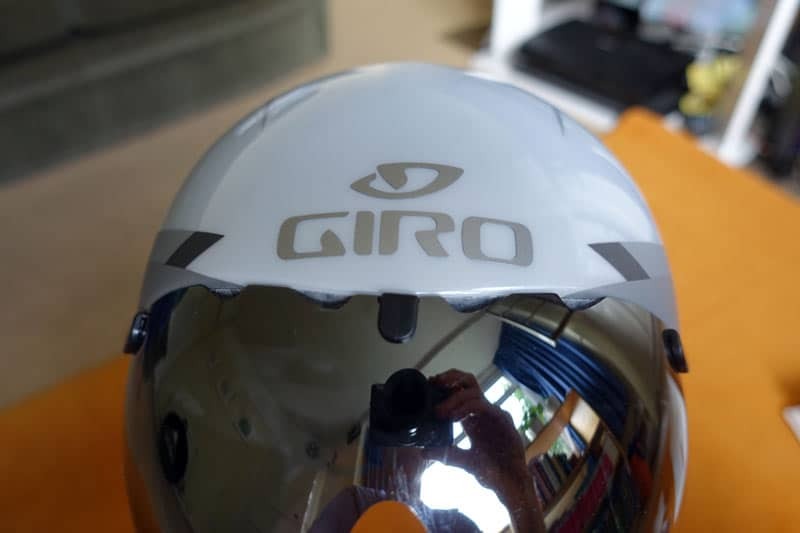 Giro Selector is an aerodynamic time trial helmet, which like most other helmets on the market makes strong claims to be very aero. The helmet is faster if you tape up vents. I did buy a visor for the Giro Advantage and stuck it on. But over time, it came off, so I taped up with electrical tape. But, it always had an impression of being a bit scruffy and never really secure. Perhaps for aesthetic reasons, I stopped using, which is a shame because it would probably have been faster than other helmets I bought. Taping on a visor isn’t great because it could start to come loose and it’s harder to rip off in misty conditions. 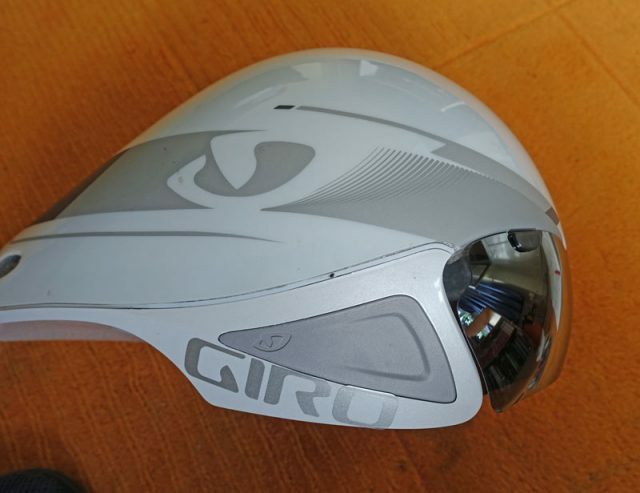 Anyway because of these disadvantages I bought Giro Selector and hope that all the theoretical advantages don’t make it slower than scruffy old one. 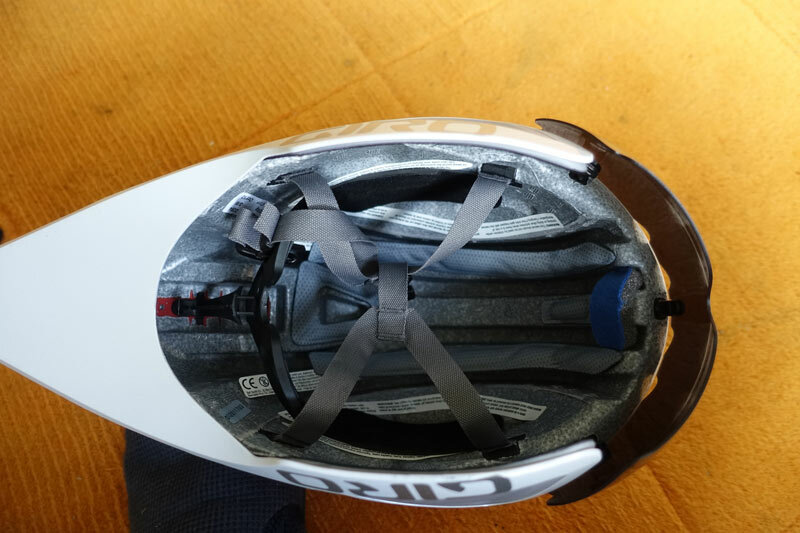 This is so you can choose size which helps helmet fit against your back, which is important for maintaining aerodynamics. I rode in ECCA 100, the padding on the front of the helmet was weak, and I was left with a bruise on front of forehead. Because of this, I didn’t dare ride for 12 hour time Trial. I will stick some more padding on. It is also tight around the ears. I also chose a size S/M which is on the limit of fitting on my head. But, I guessed a smaller size would be more aerodynamic. The Selector doesn’t have vents in the front of the helmet, but by the size of the visor. There are vents at the rear of the helmet This is more aerodynamic to cover up vents on front, but it may lead to concerns over a hot head. I’ve ridden in cool conditions (ECCA 100) and warmer conditions 25 mile TT. I didn’t feel over-heating, but then I rarely do. It uses a roc lock 5 TT rentention system. It doesn’t allow for on the fly adjustment, but I don’t need this. When I put the helmet on, I find the detachable rear tail tends to pop out. Therefore, putting on requires you to pop the tail back in. I wouldn’t recommend for triathletes because it’s not quick to put on. For me, it’s not a deal breaker, though I do worry about quality of product when it pops out so frequently. S/M (51-57cm) or M/L (55-61cm). My head was 56.5cm diameter so I chose S/M. It’s OK, though not much wriggle room. Looks good and aerodynamic. In theory it should hopefully be more aero than my last Giro Advantage (though there is no guarantee of this until testing). Quite expensive at £200, but then so are most aero helmets. Won’t be using for longer than 100 mile TT, because of lack of comfort. I believe the Bell Javelin tests well, but not quite as well as the Selector. 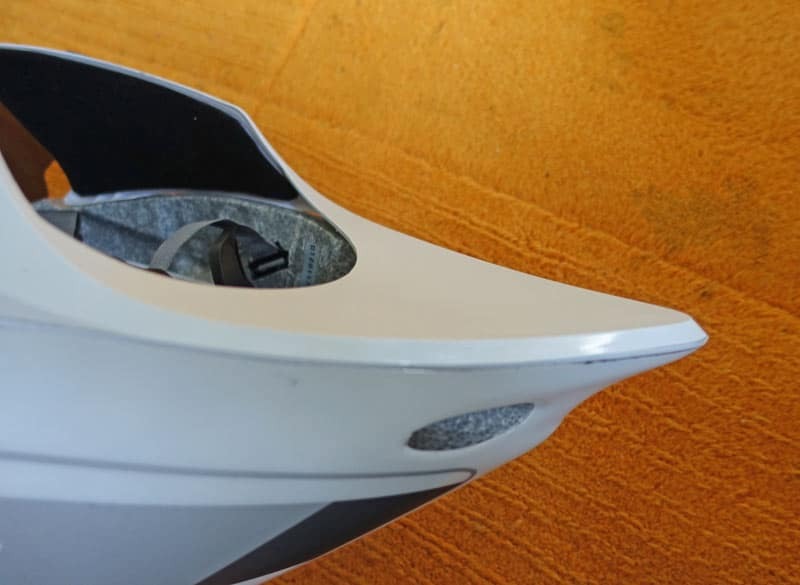 However the Javelin is half the price, comes in more than 2 sizes, has 2 small front vents and is effectively made by the same company anyway.